Years ago, when I was growing up, my parents instituted a rule that when we turned 13 we were responsible for buying our own clothes. The farm would provide us with a pair of work boots and every day coat (meaning the coat you wore to do chores and farmwork) and Mom and Dad would make sure we had a decent “good” coat (meaning it was nicer, but you wore it forever! ), but all other clothing purchases were your responsibility (we did get underwear at Christmas, though, so that helped, lol). I had no other friends who had to buy ALL of their own clothes! Seriously. If they needed new jeans, their parents bought it for them. They want a new sweater? Their parents bought it for them. Now, granted, my situation was slightly different, in that I had a good job by 13 (farming for your dad starts early and he paid pretty well. And you get LOTS of summer hours in the tractor!) But I had friends who had jobs later who still didn’t have to buy all of their own clothes. As our kids got older, we instituted the same rule (except for Reece, but that’s a whole different story). And we are completely in the minority. We warned Elisa about it several years in advance, so she was fully prepared. 1 Your kid starts learning at an early age responsibility for truly taking care of themselves. This goes beyond the responsibility they learn from doing household chores or doing their homework. 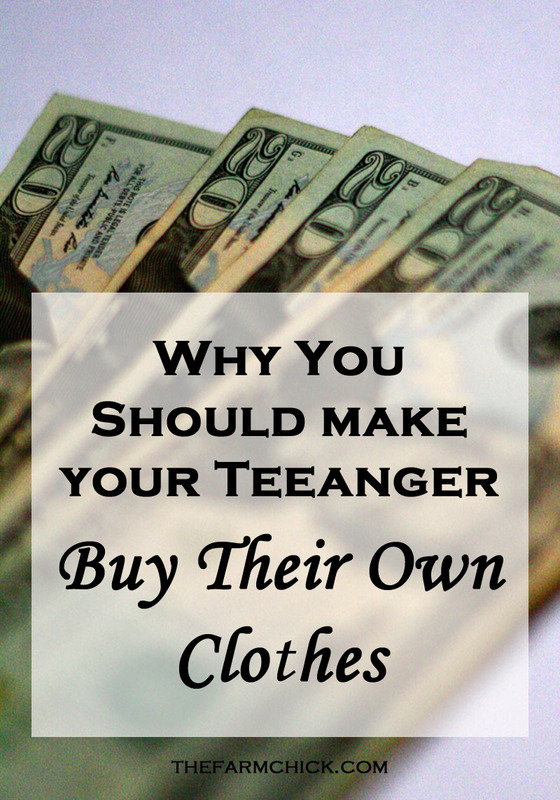 Buying your own clothes is a grown up thing! Most kids are going to leave home around 18 or so. I think it’s a good idea for them to know a little more intimately what adult responsibility really is. 2 They start learning money management. If they have to shell out their hard earned money for $100 jeans that “everybody” is wearing, it either makes them appreciate the jeans that much more, or they decide that buying $100 jeans is ludicrous and they’d rather save that money for something else. Learning money management in the safety of your parents’ home is less painful than learning it at 18 or 28 or not at all! I was a cheapskate, even as a teenager, and shopped garage sales and good deals. I didn’t care about fashion and trends (to a certain degree ;-). Learning how to do that at a young age definitely helped me as a newly married woman with an unemployed husband (another story for another time) or being a stay-at-home mom of three with a blue collar paycheck. 3 It fosters an appreciation for what your parents do for you. I didn’t feel slighted by or less loved by my parents just because they made me buy my own clothes. If anything, it made me feel more grown up and helped me realize all what they did do for me! As kids, we are so used to our parents dropping everything for us and putting our needs first. It felt good to do this on my own! This is Elisa’s actual “closet” which is actually a wardrobe thing. 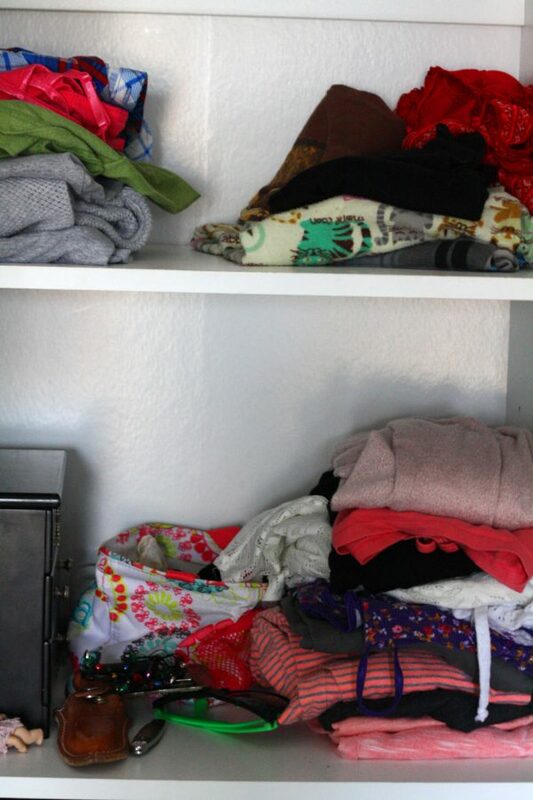 When you have a small room that you share with your little sister, it’s helpful to keep your clothing to a minimum 😉 Luckily, she’s like her mother and isn’t super concerned about clothes, lol. I asked Elisa a year ago if it bothered her that she had to buy her own clothes. Her answer, “No. Why would it?” She’s learned to look for deals on what she needs and to shop second hand, if she wants. She also doesn’t want more than necessary, which keeps her laundry more manageable (both girls are in charge of their own laundry on their own timetable). We make sure she has a good coat (our kids only have one coat for both “good” and farming, because as homeschoolers, we don’t go out and about enough to warrant having two coats! ), work boots (the farm buys those for her) and we paid for half of her good cowboy boots. I also alert her to any clothing deals I might run across online and we occasionally give clothing as gifts (she got a new T shirt and button up for Christmas). So, there you have it! On a side note, did you know that according to the University of Minnesota Extension the average lower income household (which I’m sure is where we fall) allots $52 a month for teen clothing?? That’s $624 a year! My frugal heart about gave out when I read that, lol! What do you think of our teen clothing policy? Have you done something similar or do you think we’re crazy? ?